Ever wonder what distinguishes a good bicycle rack from a bad one? Or what the optimal buffer is between a bike lane and a parked car? If so, then last week’s Bike Summit was the place for you, as active transportation activists, transportation planners, urban infrastructure experts, and assorted cycling gurus came together to consider these and other such questions. Organized by the Toronto Coalition for Active Transportation (TCAT), the second annual conference was a day-long extravaganza devoted to everything on two wheels. Curious as to how organizers feel their fledgling summit is going, we posed some questions to Nancy Smith Lea, TCAT’s Program Director, once the had event wound down. Torontoist: How have things changed in the past year? Nancy Smith Lea: There’s been a lot of active transportation momentum since our last Bike Summit in 2008. For the first time ever, the entire Toronto Bike Plan was fully funded within the 5-year Capital Plan with a $70 million investment. 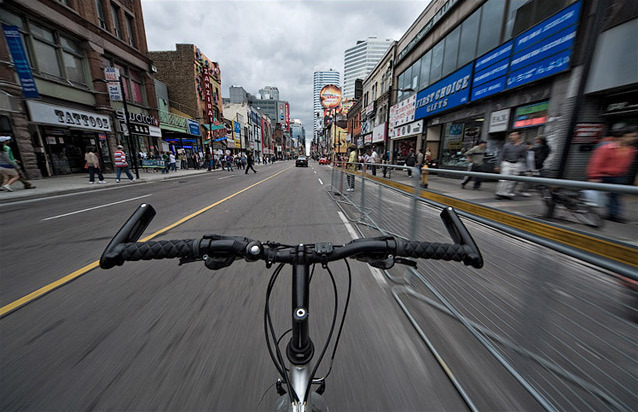 2008 saw the most kilometres of new bike lanes ever put on the road in one year in Toronto and Metrolinx unanimously voted in favour of the Regional Transportation Plan. The 25-year plan commits $20 million per year to be invested in cycling and walking in the GTHA. What did the first summit teach you, and how did this year’s compare to last? We would like to be able to have our Bike Summit go national as well and move it from city to city but right now there’s such a big demand for it just in the Toronto area alone that we kept it here for the second year. Other than demand, I’d say the biggest takeaway from last year is that the timing is right for us to make big advances in cycling—bicycling as a legitimate form of urban transportation is hitting the mainstream. With the growth in attendance this year, despite the fact that we’re in the midst of a widespread recession, I’m even more convinced of this. What was, for you, the biggest takeaway? What did you learn about that has you most excited? Joshua Benson from NYC showed us fantastic new bike lane designs where parked cars act as a buffer separating bikes from motorized traffic. In a very short turnaround they’ve put these in on three major streets and are expanding treatments on at least two streets soon. Already they’ve seen a significant increase in cycling on those streets. Eric Anderson from Berkeley showed us some great designs for off-sidewalk bike parking. Adolofo Hernandez from Chicago gave us some great insight about the importance of reaching out to ethnic communities in the suburbs. All of these speakers offered solutions that we could implement today here in Toronto. What are the cycling community’s biggest challenges and opportunities in the upcoming year? With a big bump-up in budget, Toronto is poised to ramp up the number of bicycle lanes significantly over the next year. However, I’m concerned that despite strong support on Council for bikes that they aren’t willing to do what needs to be done to make that happen quickly. To provide bike lanes on downtown streets requires converting one traffic and/or parking lane. Council isn’t convinced yet that the economic case for doing so has been made. Even with reports like the one released by the Clean Air Partnership last year that estimated the importance of on-street parking to business: the study found that only 10% of patrons drive to Bloor Street in the Annex and that the majority of merchants are supportive of removing on-street parking for a bike lane. The study also determined that cyclists and pedestrians visit these businesses the most often and spend the most money. The City is extremely cautious and wants to see more reports before they move ahead with designing a bike lane on Bloor Street. We need to convince them to move ahead boldly and decisively as they’ve done in NYC. Once implemented, the results are extremely popular and give people options for how to move around. 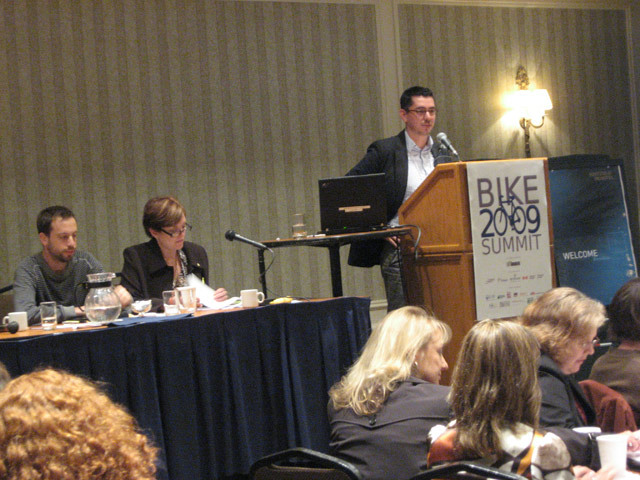 Left to right: Dave Meslin (Toronto Cyclists Union), Eleanor McMahon (Share the Road Cycling Coalition), Adolfo Hernandez (Active Transportation Alliance). Photo by Hamutal Dotan/Torontoist. Meslin also addressed some latent tensions within the activist community which flare up when pedestrians and cyclists are viewed as having competing goals for redeveloping a stretch of roadway. (“Do we use the space we’ve created on Jarvis for cycling or for pedestrians?” went the question at City Hall, as though we had to choose between them.) 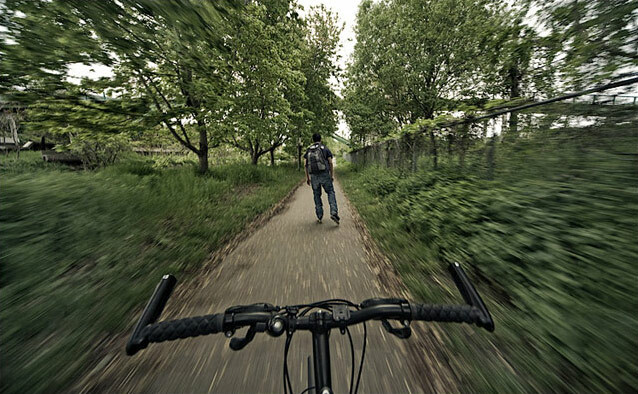 He argued that the now-popular term “active transportation” (the catch-all used to refer to pedestrians and cyclists) may in fact be confusing matters: it conflates the goals of pedestrianization (making streets themselves destinations, hubs of activity, and significant contributors to the neighbourhoods through which they run) with those of sustainable transportation (getting people from A to B). Cycling and walking serve different functions and require different kinds of infrastructure, and each needs to be treated on its own terms. And regarding the now-infamous “war on cars” that is purportedly being waged at City Hall? “It is a war,” said Meslin, “a war on old thinking.” The essential point: we are simply out of road capacity—there are no more car-based lanes to build—and it’s time to reimagine the streets we do have to address all of their users adequately.